For the video game, see Pyre (video game). For the English band The Jam's song, see Funeral Pyre. "Pyres" redirects here. For the British guitarist, see Gian Pyres. A pyre (Ancient Greek: πυρά; pyrá, from πῦρ, pyr, "fire"), also known as a funeral pyre, is a structure, usually made of wood, for burning a body as part of a funeral rite or execution. As a form of cremation, a body is placed upon or under the pyre, which is then set on fire. Traditionally, pyres are used for the cremation of the dead in the Hindu and Sikh religions, a practice which dates back several thousands of years. Funeral pyres were also used in Viking and Roman culture. Pyres and bonfires are used in celebrations and remembrance in services. Examples of these are Guy Fawkes Night in the United Kingdom and some Commonwealth countries, where the 'Guy', either seen as an effigy of Guy Fawkes or the Pope, is burned. Funeral pyres were used by the Nazis to cremate the bodies of 1,500,000+ prisoners in Belzec, Sobibor and Treblinka extermination camps, as opposed to the crematoria used in other camps. Pyres have also been used to dispose of large quantities of livestock in agriculture, particularly those infected with disease. A traditional Hindu funeral pyre takes six hours and burns 500–600 kilogrammes (1,102–1,323 pounds) of wood to burn a body completely. Every year fifty to sixty million trees are burned during cremations in India, which results in about eight million tonnes of carbon dioxide or greenhouse gas emissions. Air pollution, deforestation and large quantities of ash, which are later thrown into rivers, adding to the toxicity of their waters, pose great environmental problems. Mokshda, a Delhi-based non-governmental organisation working to reduce the environmental impact of funeral pyres, claims to have created an alternative cremation system that reduces heat loss. With it, it takes up to two hours and 150–200 kilograms (330–440 lb) of wood to burn a body. As a result, the cost is reduced significantly and emissions are cut by up to 60%. 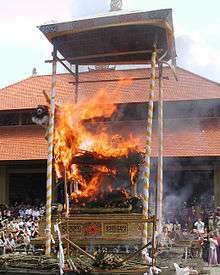 While funeral pyres are still used in several cultures they are uncommon and even illegal in some countries, particularly in the Western World. Despite cremation being commonplace, open air cremations in the United Kingdom were thought to be unlawful under the Cremation Act 1902 – although in recent years, some have taken place amongst immigrant communities. In February 2010, a court of appeals in the United Kingdom ruled that a cremation on an open pyre would be legal inside of a building with an open roof, well away from roads and homes. In the U.S., a group in Crestone, Colorado has obtained legal permission and created a permanent cement pyre structure to perform around 12 “open-air cremations” a year. ↑ πυρά, πῦρ. Liddell, Henry George; Scott, Robert; A Greek–English Lexicon at the Perseus Project. ↑ Harper, Douglas. "pyre". Online Etymology Dictionary. ↑ Norfolk, Andrew (13 July 2006). "'Illegal' funeral pyre burnt in secret". The Times. London. Retrieved 19 January 2011. 1 2 3 4 Fernando, Shehani (14 July 2006). "The question: Why are funeral pyres illegal?". The Guardian. London. Retrieved 19 January 2011. 1 2 3 Kermeliotis, Teo (17 September 2011). "India's burning issue with emissions from Hindu funeral pyres". CNN. Retrieved 4 July 2013. ↑ Nirmala George (17 November 2015). "India court orders action on crematorium near Taj Mahal". Retrieved 19 November 2015. ↑ Taylor, Matthew (10 February 2010). "Hindu man wins court battle for open-air cremation pyre". The Guardian. London. ↑ Moreno, Ivan (31 January 2011). "Funeral Pyres An Option In Crestone". CBS Denver. Denver. Retrieved 4 May 2011. Wikimedia Commons has media related to Funeral pyres.